President Tran Dai Quang August 31 sent a letter of congratulations to teachers, parents, and students on the occasion of the new academic year. In a letter sent to teaching staffs, students and parents nationwide, the President greeted all appraising the education sector’s activities to improve teaching and learning quality. Accordingly the sector yielded good results. 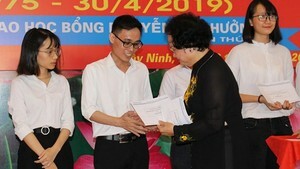 Vietnamese students captured prizes from Olympiad and other international science competitions. The President emphasized the country is proud of the two Vietnamese universities that are named in the list of the world’s 1,000 best schools. In the letter, he said “On behalf of the Party and the government, I praise the sector’s efforts in gaining achievements in the school year”. For the new academic, he expected the sector to achieve more success to satisfy the demand of industrialization and integration. The sector should take heed to education and training in disadvantaged areas and in regions where ethnic minority people live as well as ensure equal access to all levels of education and vocational training for children of social welfare brackets, he said. In the last sentence, he wished teaching staffs and students to have more achievements in the new school year.